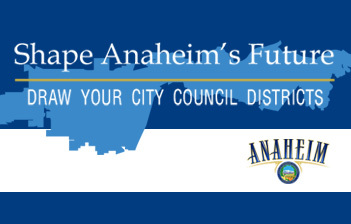 ANAHEIM, CA - (May 28, 2015) - Community meetings are being held to gather comments and ideas for drawing district boundaries. The Advisory Committee on Electoral Districts is reaching out to residents by meeting on various evenings and in neighborhood communities, as well as City Hall. The next meetings, to be held at 6:30 p.m., are set for Thursday, June 4, at the Brookhurst Community Center, 2271 W. Crescent Ave; Tuesday, June 9 at the East Anaheim Community Center, 8201 E. Santa Ana Canyon Rd. ; Wednesday, July 1 at City Hall, 200 S. Anaheim Blvd, 1st floor; and Wednesday, July 8 at Ponderosa Family Resource Center. One hour prior and immediately following each meeting, demographer, Justin Levitt, is available to answer questions and provide individuals with support in using the online mapping tool to draw district boundaries or pencil in boundaries on paper maps for submittal to the City Clerk. The Hon. Edward J. Wallin (Ret.) of Anaheim chairs an Advisory Committee of five retired Superior Court judges who volunteered to gather comments and maps developed by residents. The Committee will recommend the shape of Anaheim’s voting districts to the City Council, which will hold public hearings and make a final decision by the end of 2015. The City encourages residents to be part of the conversation and share your suggestions. For additional information, go to www.anaheim.net/districts for mapping instructions, FAQs and the meeting calendar.